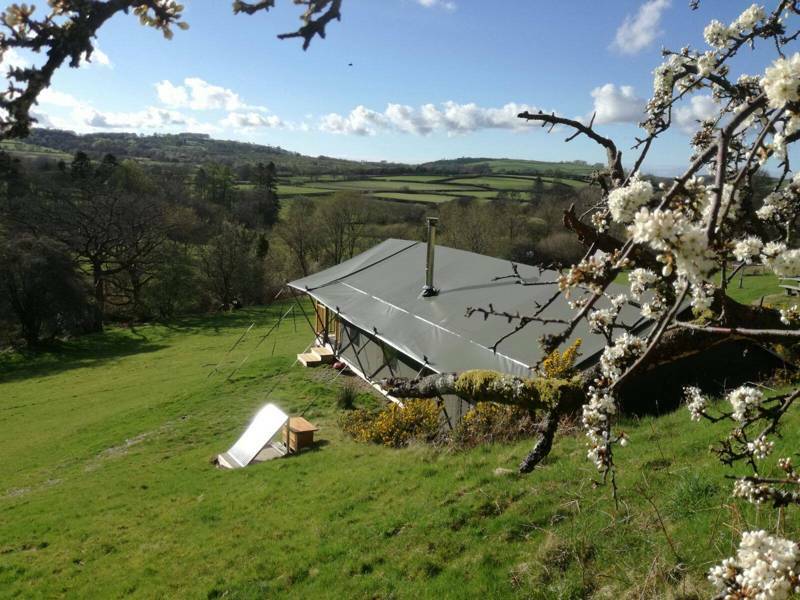 Thistledown Glamping has been entirely designed, created and built by Tim & Claire so you will never find another Shepherd Hut or site like ours. 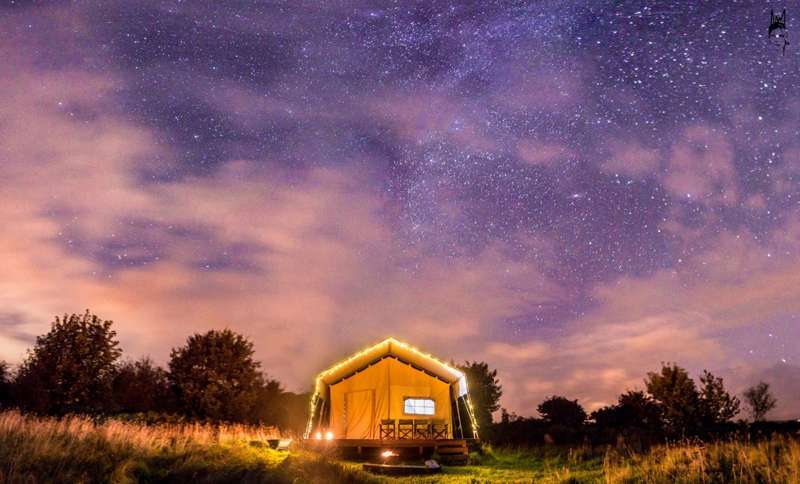 Nestled in a quiet corner of West Wales, the stunning Shepherd Huts at Thistledown Glamping are tucked away in a pretty thistle scattered meadow. With their unique touches & quirky style we aim to bring you a little bit of luxury in natural surroundings. 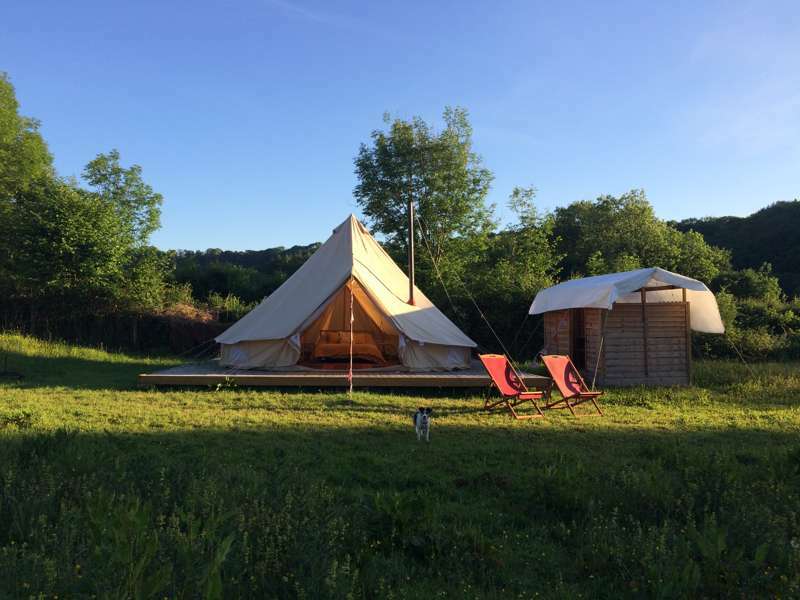 The huts have electricity, WiFi, heating, quirky private bathrooms a short stroll away & indoor cooking facilities as well as everything you would expect from a glamping adventure such as a fire pit, wood fired hot tub, beautiful scenery & outdoor seating so you really can have it all! Our handcrafted Shepherd Huts are waiting for you to enjoy; sit back in your own private outside area, breathe in the scents and sounds of our tranquil corner of West Wales and watch the Red Kites soaring overhead. You are welcome to bring one well behaved dog. 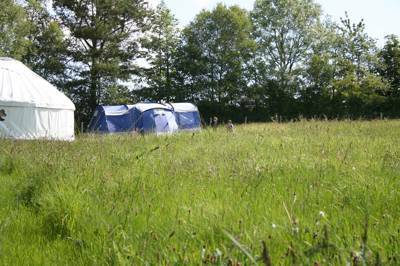 For latest availability and best prices for Thistledown Glamping, please use the Date Search above. Wren sleeps 2 in a raised double bed. 'Finch' sleeps 4, with the raised double, plus bunk beds. Inside you'll find a compact kitchen with a 2 ring electric hob, kettle, toaster, sink, cutlery, crockery and basic cooking utensils, plus a table and chairs, externally controlled heaters, a TV, free Wi-Fi, shelving and storage. Towels and bedding all provided. In the enclosed outside area there is decking with table and chairs, a fire pit with BBQ utensils and skillets. 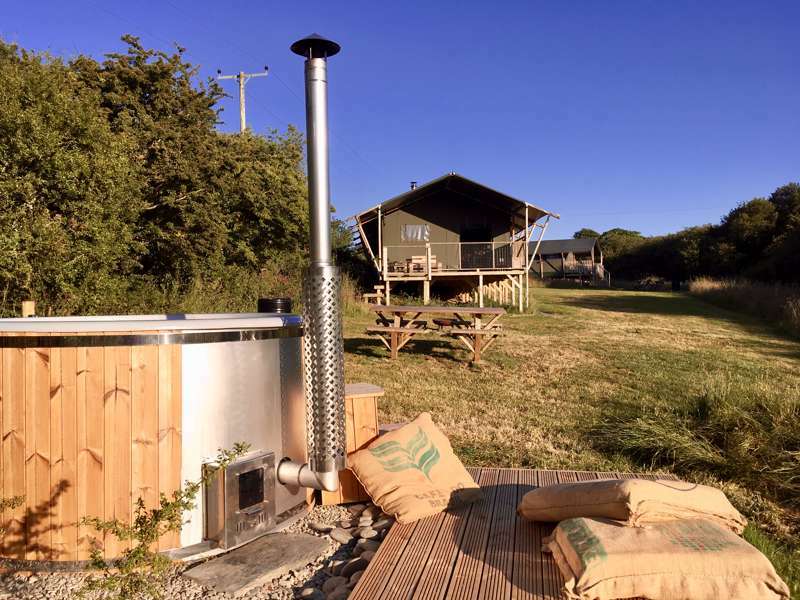 The 'Wren' hut has a private, wood-fired hot tub directly outside (wood for this is provided for the duration of your stay). 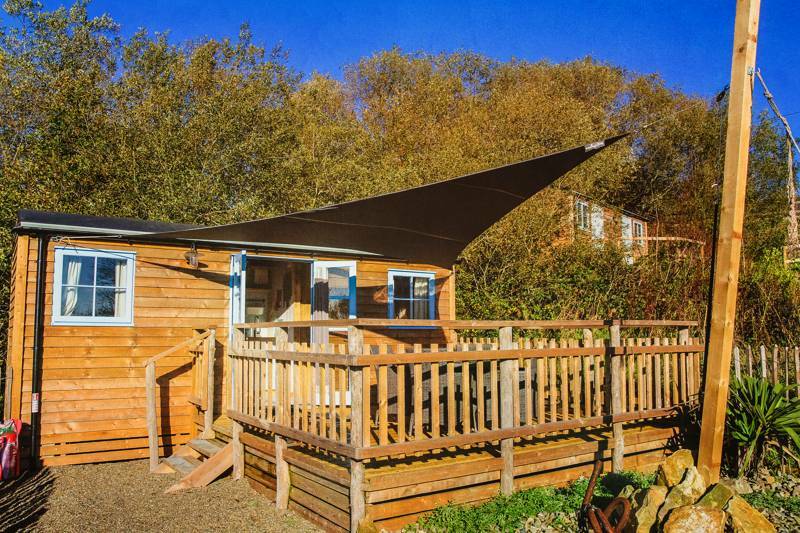 Each hut has its own private bathroom a short walk away – this has a rain-head shower, flushing loo, a sink, mirror and a heated towel rail. 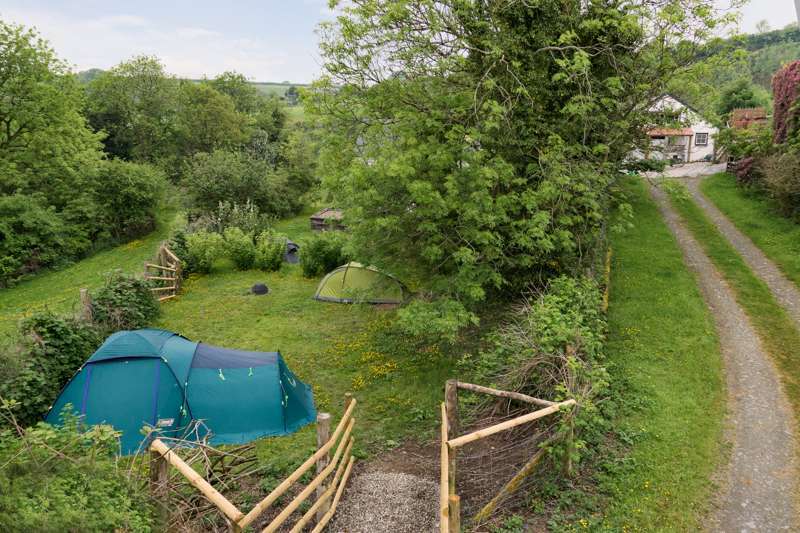 Parking is at the top of the field and both shepherd huts are a short walk down a gravel pathway (unfortunately the site is not suitable for people who are less physically able). Wood for the fire pits can be purchased on site. It's a 20-minute drive (11 miles) to Cardigan Bay. Famous for its bottlenose dolphins, you can join dolphin watching boat trips from New Quay's pretty harbour (also the place to go for fish and chips; see Food & Drink) or try visiting the shingle beach at Cwmtydu, which is also known as a regular place for spotting dolphins and seals (from mid September onwards you can often see seal pups on the beach). 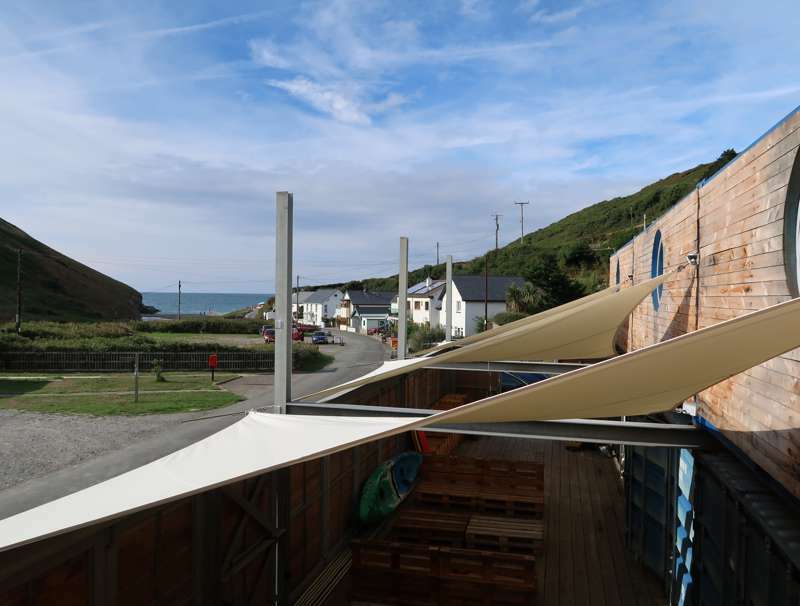 Owned by the National Trust, Mwnt (16 miles) is a particularly good beach – there is no avoiding the long, steep walk there but it makes it one of the most secluded spots along the coast – and Aberporth (12 miles) is also recommended – a blue flag beach with excellent water quality. 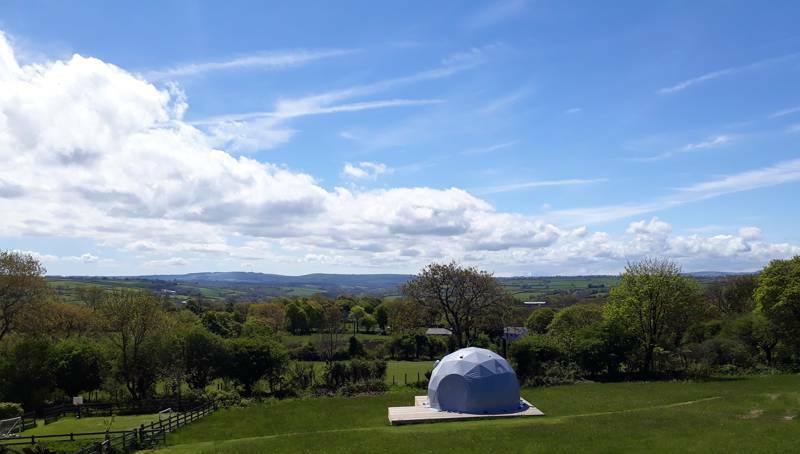 The National Wool Museum (02920 573070) is a short drive from Thistledown Glamping, while Newcastle Emlyn is 12 minutes away and boasts the ruins of a 13th century castle, good restaurants, and a country market every Friday. The River Teifi offers trout fishing, walking trails and canoeing in most places. If you're here with the kids, a ride on the local steam train is a must. The Teifi Valley Railway (01559 371077) is a narrow-gauge tourist railway located at Henllan. Until recently it has been closed and disused but it has just re-opened for rides and is a real hidden treasure. 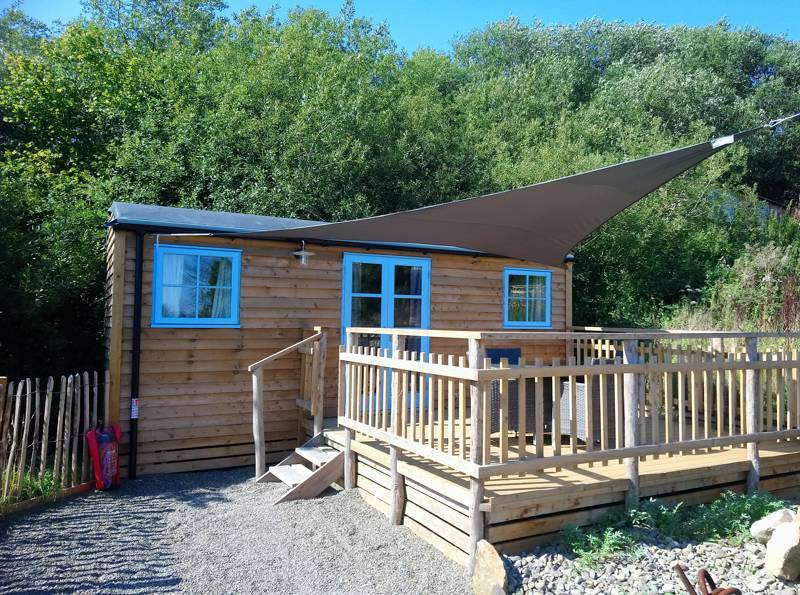 Thistledown Glamping offer breakfast hampers and a 'sweet treat' hamper for those with a sweet tooth (all available to pre-book) and there's a guest information file in each hut with lists of local pubs and restaurants nearby. It's a 5-minute drive to The Daffodil (01559 370343) in Penrhiwllan, a very dog-friendly local pub with a delicious choice of food. 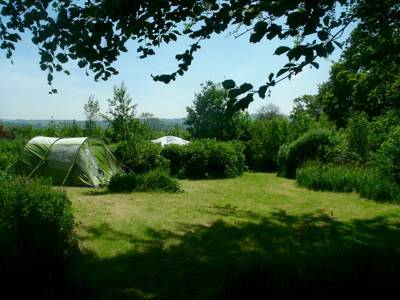 It can also be reached by a scenic, 30-minute walk down an old country road directly from Thistledown Glamping. If you're heading to the coast, The Lime Crab (01545 561400) in New Quay offers the best fish and chips in the area (according to Tim and Claire at least) and also offer gluten free options. There's also a good ice cream parlour (01545 561307) in New Quay, along with a range of independent cafés, bars and restaurants. The local town of Llandysul also has a range of takeaways if you want a bite to take back to the shepherd's hut. The village of Croeslan is on the A486 (from the north and west, you'll be following the road towards "Ffostrasol"; from the south and east, you'll be following it towards New Quay). In the middle of Croeslan there is a petrol station and a Post Office. Take the turn directly opposite the Post Office. 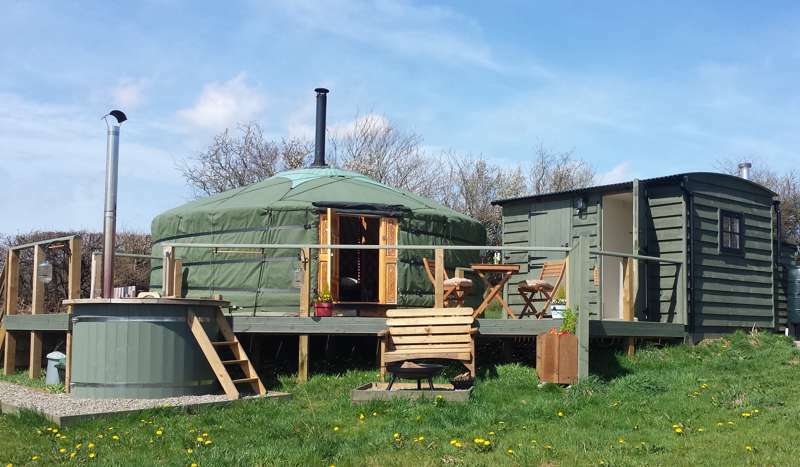 Thistledown Glamping is ½ mile down the road on your right. When you arrive look out for the Thistledown sign by the gate and enter. On the white-washed building in the car park you will see a cupboard on the wall, ring the bell and Tim or Claire will appear! The nearest railway is 3 miles away but, since it's the truly tiny Teifi Valley narrow gauge railway, it's not much use as a convenient mode of transport! For the nearest main-line station it's an arduous near-20-mile trip (half an hour by car) to Carmarthen and there's not a particularly frequent bus service to this area. In short, don't rely on public transport to get here. 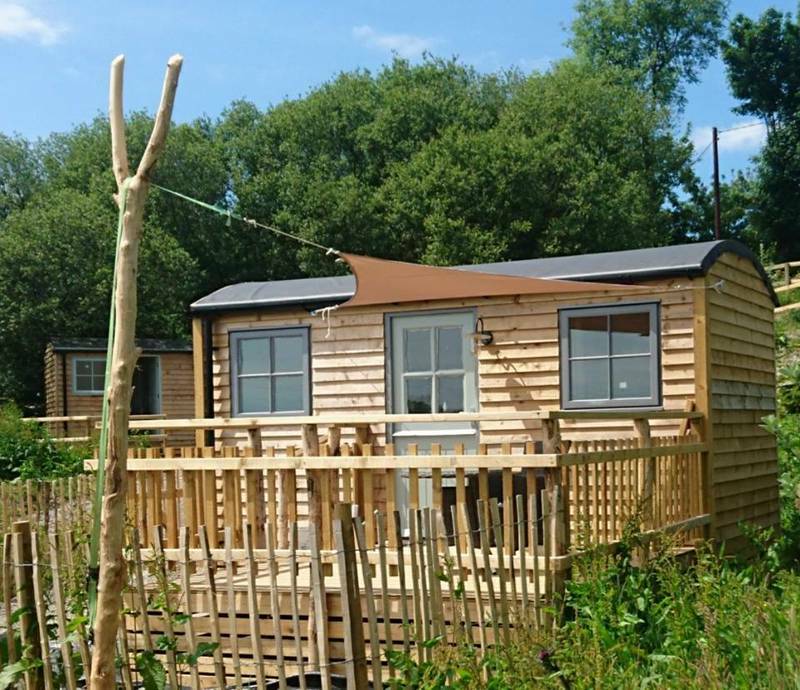 A pair of luxury shepherd's huts, sleeping 2 and sleeping 4.